Running is an integral aspect of my daily summertime routine. For me, going for a long jog is not just a way to train for fall sports, but it's also a way to spend quality time with my friends, get my heart pumpin', and burn off all those soft-serve cones decked in rainbow sprinkles from my favorite ice-cream shack on the lake. Now, I don't know about you, but good tunes and motivational words from friends are always what get me through the last couple of miles. So, since I can't be there to cheer you on myself, I compiled a playlist that is sure to keep you going until the bitter end. Swedish pancakes are a sacred, summertime treat in my die-hard Scandinavian family. Every Saturday morning during the months of June, July, and August a multitude of family members, friends, and neighbors flocks to my grandmother's back porch to pile their plates high with the scrumptious Scandinavian delicacy, and toppings of course. Grandma and Gramps, the Swedish Pancake Gurus, are known to cook as many as fifty of the beloved crepes for just one brunch. What can I say, us Swedes demand our pancakes. Especially Cal… Cal really demands them. And when the boy's stomach grumbles and pleads for more pancakes come tumbling from his mouth, my grandmother always obliges because Swedish Pancakes are not only a delightful mid-morning indulgence, but they are also a reminder of my family's roots. And let me tell you, that reminder is always more gratifying than the post-pancake food coma that inevitably follows the Scandinavian feast. "My grandmother, Mor-mor, made my sister and I Swedish pancakes for breakfast a couple of times a week. She used a rather small fry pan - probably 7 or 8 inches. She took them out of the pan and spread jam on them and then rolled them up. It was a very special delight. 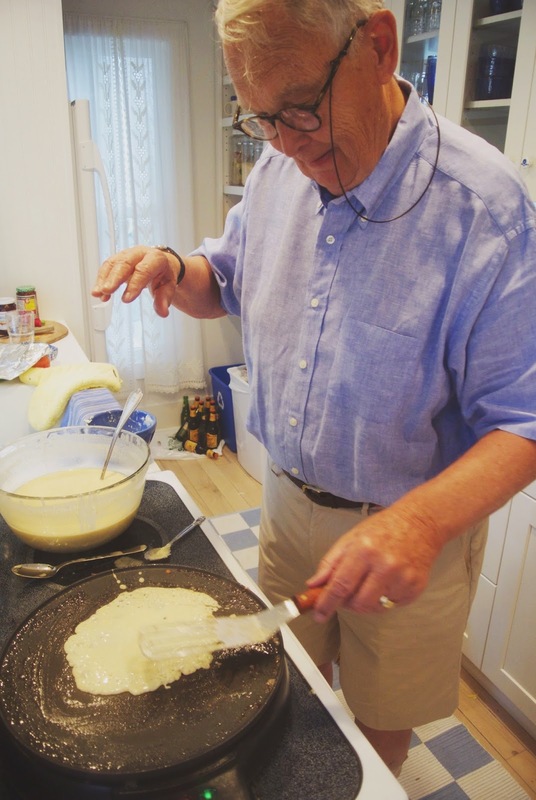 "Many years ago I started making Swedish pancakes for my grands here in Chautauqua, where we spend the summer months. I usually use a mix - either a combination of Kungsoren Swedish Pancake mix and waffle mix or Lund's Swedish pancake mix. I can buy them at Peterson's farm stand or Eklof's bakery in Jamestown, NY. I always make at least one box - a double recipe or sometimes two boxes if the grandkids bring their friends. "I make up the batter the night before. If I use the Lund's I mix 1 cup Swedish pancake mix, 1-1/2 cups water or milk, and one egg. The Kungsornen only needs water (1-1/4 cup mix to 1-1/4 cup water. I mix the batter very well with a fork or a whisk and let the batter sit covered in the fridge overnight. The next morning I cook them. "For some years I used two nonstick 8-10 inch frying pans. Then I tried two crepe pans that was even better. Now I use an electric crepe maker that I got at Stonewall kitchen. Now that's the best. "I preheat the crepe maker to between 4 and 5. I spread the griddle with butter for every pancake. I use a medium sized ladle full of batter for each pancake. I pour it on the griddle and then pick up the crepe maker and swirl the batter around so it will be as thin as possible. I let it cook until the entire pancake is covered with air bubble holes and then I flip it and wait 20- 50 seconds for it to cook completely. Then I take the pancake off and fold it in half and in half again and put it on a platter in the oven to keep it warm. "For the toppings, I get up early Saturday morning and clean and slice the fruit, the strawberries, the peaches, the raspberries and wash and drain the blueberries. I also put jam, lingonberries, and maple syrup into little bowls. And we like whipped cream too. "I also cook thick bacon which we buy at the meat and deli counter at The Light House, the small local grocery store. I put the bacon slices on a jelly roll pan and put it in a cold oven and set it at 375 and bake it for 20 minutes."